The fans of the extra-ordinary TV show The Big Bang Theory has increased exponentially and the show is also only getting better. With eight successful television seasons and confirmed two more, it is the only show which has been compared with Friends. Thanks to the ultimate Big Bang Theory fans who not only design coolest merchandise shown on the show, but also come up with their own geeky ideas to make the perfect gifts for anyone. This holiday season, shower your Big Bang Theory lover (or yourself) with these most loved geeky presents under just $30. Remember that episode in which Sheldon sets an alarm to wake up early, then wakes up few seconds before the alarm goes off and then turns the alarm off himself? (Geeky, right!) This hilarious clock is dedicated to him. Now you might ask why this one doesn't have an alarm? Well, one, because it is a wall clock and two, because the ultimate Math nerds don't need one. They get up before their alarm starts panicking. What does the number "11" mean? You probably got around to understanding all the numbers, except 11. Right? Let me make that clear for you. "0b" means "0" in front of "b". In hexadecimal number system, numbers are shown using 16 letters. These letters are 0, 1, 2, 3...up to 9. Then, a, b, c... to f represents 10 to 15. That's why b=11. And any zero before a number does not count, so 0b equals to 011 = 11 = 11 o' clock! This official, fan-designed Sheldon Cooper Clock sells for $19.99. Come on Leonard, show some respect for your best friend. 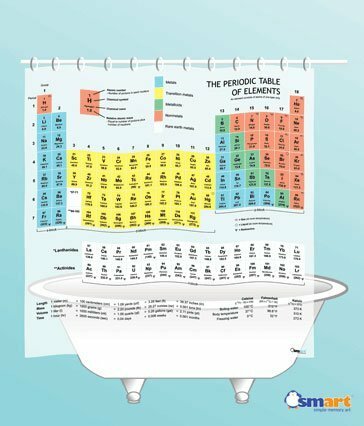 He is holding his pee so that you and Priya can take shower together hiding behind the periodic table shower curtain. Now is not the time to remember all the "elements". This was the scene from the episode The Agreement Dissection from the fourth season. Poor Sheldon, who was experiencing a very major force (thanks to 32 ounces of banana smoothie and just 16 ounces of bladder! ), ultimately had to run to Penny's bathroom. This one's the same "SMART" shower curtain showcased in the TV show. Over 152 reviewers have rated it 5 star. Its 71 x 71 inch size is perfectly enough for almost all bath tubs. In case it falls short, it can be used to wrap around. Another plus point is that it's made from a environmentally friendly raw material called "EVA Vinyl". 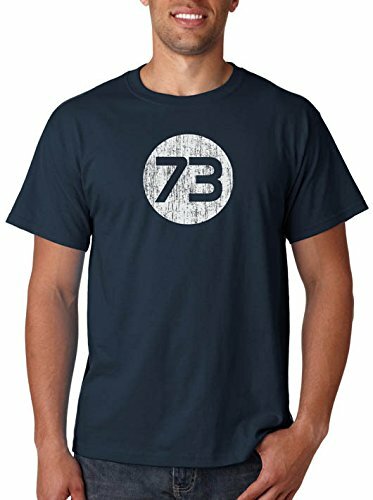 If you haven't watched TBBT yet (and in which case, I hate you) and don't know what the number 73 represents, this shirt might be just plain boring shirt to you. But just so you know, I would be honored to wear this. Why? Because "73" is the best number out there. Don't believe me? See the following video for yourself. 73 is the Chuck Norris of numbers. It does not die, nor will anyone forget it. Long live number 73! The best number is 73 because it is the 21st prime number, its mirror 37 is the 12th and its mirror 21 is the product of multiplying the numbers - yes, 7 and 3. Awesome, right? Bottom line: 73 is the new cool in shirts! Available for sizes medium to XL, starting $17.95 only. Follow Sheldon's every fashion move, for he is the coolest geek. Yes, you heard that right. FUNKO does have pop figurine for Penny, your favorite girl in TBBT. Even if she isn’t your favorite character, here is a thought why you might want to buy her pop figure: what if FUNKO has secret connection with the show writers and decide to include her last name in the toy? Yeah, probably not gonna happen. But she’s so witty and sarcastic, plus her sarcastic duck faced smiles are so cute. Aww! The only downside to the pop toy: It doesn't have Penny's latest Season 8 haircut. Meh, won't bother me! Also available pop figures are for Sheldon, Leonard, Amy Farrah Fowler (I don't know why I always need to say her full name, may be because it's so funny), Raj, Howard and Bernadette. That means all. The entire cast will be a nice collection in the study table. Sheldon would jump into excitement if he had this mug. It holds 11 ounces of your favorite hot beverage. 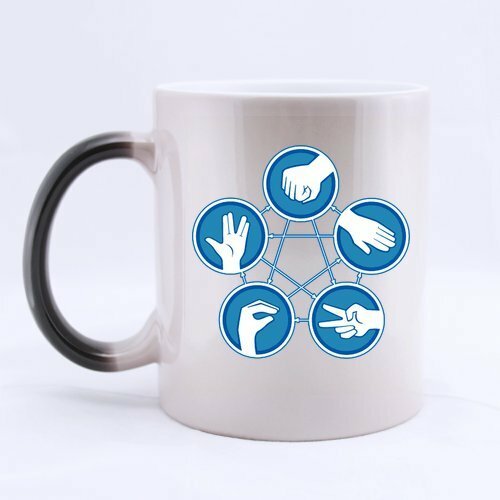 Another pro to having this mug is that you will not forget what beats what in the game of Rock-Paper-Scissors-Lizard-Spock. Also available as a non-morph version. But again, it does not have the magic of pouring a hot coffee. Did someone say hot beverage? I love that shower curtain. Get clean and learn at the same time! Haha. Yes, that's a very nerdy idea! Thank you for stopping by.